Reflections on European Democracy » Belgium proof that the EU will never work? Belgium proof that the EU will never work? Although progress is now being made on the less controversial dossiers (discussions on constitutional change and social security should start later this week), the political crisis in Belgium is not entirely over yet, as foreign media will be delighted to hear. But do cultural and language differences really make the country fall apart? But this is way too easy. First of all, I am not at all convinced that the differences within Belgium are too big for Belgium to continue as a country. And secondly, I very much doubt that the rise of ethnic nationalism in Belgium is a bottom-up process (it was not in Yugoslavia either, by the way). 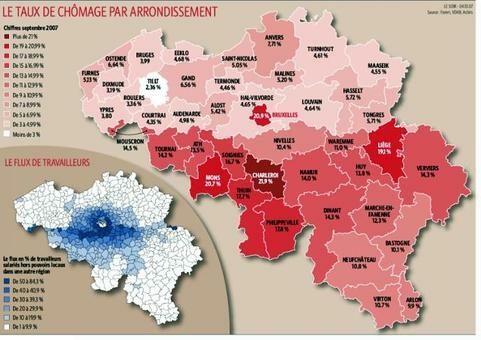 Socio-economic differences are often brought up as a reason for Belgium to split, and it is true that unemployment figures are very different on both sides of the language divide (kudos for the map). But both social policy and (mostly) taxation are federal competences (i.e. the same all over the country), and the regional differences in economic policy I feel tend to be exaggerated. What is clear is that the outsets as they happened to emerge from history were very different. Think Wallonia’s past in mining and heavy industry, think South of Italy, think North-East England: Wallonia would be a poor region even in a unitary state, except that in that case nobody would question the amount of money pumped into it from other parts of the country. The language difference or the fact that language is tied to regions does not make it impossible for Belgium to be a viable state either. What is true is that Belgians do no longer have a common political space, instead of which there are now two strictly separated spaces: one with Flemish politicians catering to Flemish voters and Dutch-speaking media, and one with French-speaking politicians catering to French-speaking voters and French-speaking media. But if this caused the political problem, why then is Switzerland not falling apart either? That country has four languages and a quite similar election system, but (despite having a political problem of its own) it does not show the same signs of regional infighting as Belgium these days. So although the absence of a common political space does seem to be part of Belgium’s problem, I think it is sloppy logic to blame the problems on the linguistic divide. The correlation we see does not prove there is a causation. Nor is regionalism as a political phenomenon a reason for secession, although its recent surge among politicians sparked the current crisis. Regionalism is not incompatible with federalism. In fact they are two sides of the same medal: it is normal in any federation (or unitary state for that matter) that there is dicussion about the vertical distribution of powers. If the system of constitution-making functions well, the resulting arrangement ends up somewhere in the middle: a dynamic equilibrium between those who want specific powers to be moved up the constitutional hierarchy and those who want to see them moved down. This is not an all-or-nothing game by the way: the same person often wants some powers to be moved up, and some down. All mainstream political parties in Flanders for instance support moving powers down from the Belgian level to the regions, as well as moving other powers up from either of these levels to the EU. This seems to be a nuance lost on those who insist on blaming Flemish “nationalism” for the current political crisis. The current political problems do seem connected with a general sense among voters (not only in Belgium) of not being represented by the political system (this in turn is to be seen as part of modernity’s acute and even more general struggle to reconnect with its moral and spiritual roots – but that is a different story). In this view the other half of Belgium fulfills the function of Girardian scapegoat – like the EU, globalisation or terrorists do in many other countries. The electoral success of the populist, xenophobe Vlaams Belang party in Flanders, will have acted as a catalyst. In response to this party’s singling out of immigrants, it is easier for mainstream parties to seek an alternative, politically more correct scapegoat than to tell the unwelcome truth that the problem is complicated and that solving it takes time. The other half of the country is perfect for this role, as it is part of the system yet stands out as different, and does not go away too easily (which would expose the falsity of the claims). In this sense the communitarian stand-off would be how the Western world’s more general roots searching and scapegoating happens to have incarnated in Belgium, and language is just the stick to beat the dog with. Especially in Flanders, where the discussion started, the driving force behind “ethnic nationalism” is the political caste – not the population which only recently, after more than a hundred twenty days of trying to negotiate a new government and a new constitutional arrangement, has started to follow politicians in their separatist conclusions. So, contrary to the view expressed in the FT article above, what is elitist in Belgium is not (or no longer!) unitary belgicism, but ethnic nationalism. In Belgium’s case, this distrust of voters against the political system and class may be exacerbated by the country’s constitutional arrangements. Apart from the federal government and the three regional ones, there are three, partly overlapping, community governments. This results in 6 governments and 7 parliaments ruling the country together. The philosophy behind it is that the federal and regional governments deal with territorial, “physical” issues (like road-building) while the community governments deal with the language-related, “personal” ones (like education). This is an interesting, beautiful idea which I have often applauded in the past. But we may have to conclude that it has turned out to be too complicated for practical use, as the resulting division of tasks between the governments inevitably ends up to be rather fuzzy and untransparent. As tax is also mostly levied federally but spent regionally, it is very difficult for Belgian voters to know which politician is really responsible – which makes the system even more vulnerable for the scapegoat mechanism. First of all, the system needs to become more straightforward and transparent, so it is easier for ordinary voters to see when a politician is addressing something he can actually change, and when he is talking about something outside his influence. Belgium will have to become more like ordinary federations, with fewer governments. The communities will have to go, only the three regions and the federation must stay. Each region (and the German-speaking sub-region) will get its own official language (two for Brussels). A clear choice is needed on the purpose of language policy. In my view this purpose is linked to the preservation of culture, not to cater to individual needs. This means that most, if not all, of the current “facilities” as they exist around Brussels and along the language border ought to disappear, whereas they could perhaps be introduced for the French-speaking minority in Ghent. Most importantly, a more direct link must be established between taxes and their spending. Regional policies should be funded by regional taxes, federal taxes should be used to fund federal policies – or at least should be spent under the political responsibility and the supervision of the federal government. In this way voters will at least have someone to turn to (and know who to turn to) in case they are unhappy with the outcome of policies. Especially the last idea in the above could have a centralising effect if changes to the division of competences between the various state levels are difficult to undo. To compensate for this threat to subsidiarity (and in order to give politicians something to tinker with), we introduce another new element: flexibility. The constitution must continue to define decision-making procedures and continue to be difficult to change (requiring double majorities or whatever seems appriopriate). But a separate “Kompetenzkatalog” that lists the policy issues for which each state level is responsible must be (almost) as flexible as an ordinary law, so that it can be adapted every time the constellation of federal and regional governments changes after new elections. Incidentally, the exact same advice was given by former Belgian PM Jean-Luc Dehaene and his fellow ‘wise men’ for the EU Treaties in their 1999 report The Institutional Implications of Enlargement. As we know, the authors of the EU Constitution chose eventually to keep Part III (the policy part) in the Treaty instead of giving it a “lighter”, more easily changeable, status – with well-known consequences at least for the referendum in France. Switzerland is proof that arrangements of a federal constitution are thinkable in which, even if political problems and discontent remain, the continued existence and governability of the state is not under constant threat. The ideas outlined in the above might help to get to such an arrangement for Belgium. And applying them to the EU (EU taxes for EU policies, a flexible Kompetenzkatalog) would be a good idea as well. This entry was posted on Thursday, 18 October 2007 at 00:16	and is filed under Constitution, European Politics. You can follow any responses to this entry through the RSS 2.0 feed. You can leave a response, or trackback from your own site. So, what are the chances of you getting back into the habit, then? We need more of this sort of thing in Euroblogland. I will try to post more, honestly.